These pretty acrylic hearts look like real stones. 15mm beads with 2mm vertical hole. approx 225 pieces per 1/2-lb bag. These pretty acrylic hearts look like real stones! 15mm beads with a 2mm vertical hole. Approx. 225 pieces per 1/2-lb. bag. I have bought this twice so far. 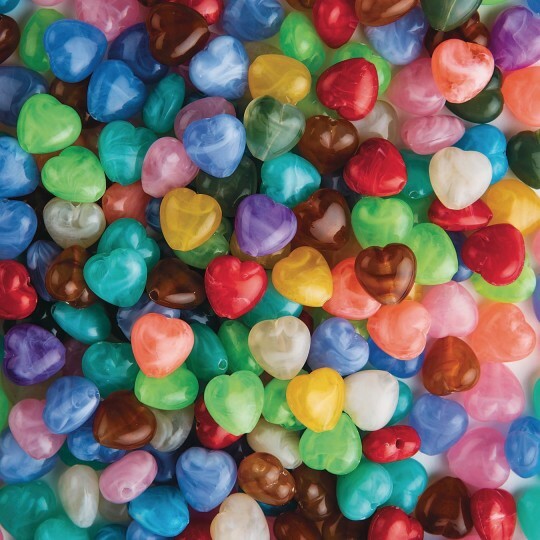 These hearts are great for adding elegance to my beading projects. I used a head pin to make the hearts into charms. I added assorted beads and a coiless safty pin to make Valentine pins. The ladies liked them because of the diffirent colors not just pink and red.